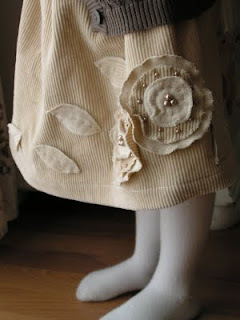 Being a lover of all things beautiful, especially ones that can be made, I was quite taken by this lovely corduroy skirt. It's so charming, don't you think? I have dreams of one day owning a chunky corduroy sofa. I just love the texture of it. I can't wait to get to the fabric store after the holidays, buy up some yardage of this stuff, and get to skirt-making. Thanks bunches to Sachiko, whose cleverness I've swiped for this post. Wanna visit her? Check her out here to see the complete info on this DARLING goodie. My daughter loves this skirt. I want to make her another with different color corduroy.